Avdekke Maya-mysteriene til Cobas atmosfæriske ruiner på en spennende helgedagstur fra Cancun og Riviera Maya. Stig opp til toppen av den gamle byens høyeste pyramide og absorbere panoramautsikt over Yucatan-halvøya. Berik din kunnskap om maya sivilisasjon med en dyktig guide og se arkeologiske attraksjoner med gammel opprinnelse. Praktisk rundturstransport fra hotellet og en tilfredsstillende lunsj er inkludert på denne turen. Avreise fra hotellet ditt i Cancun eller Riviera Maya i en komfortabel minivan med aircondition, og beundre det yucatanske landskapet mens du drar til det gamle stedet i Coba-ruinene. Hør som din oppnådde guide setter den historiske scenen og forklarer hvordan Coba spilte en sentral rolle i Maya-sivilisasjonen. 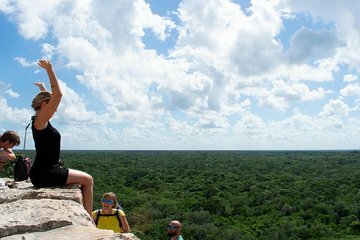 Ankomme på stedet og nyt 2 timer med uavhengig utforskning; Stig opp til toppen av den høyeste pyramiden i Yucatan-regionen og nyt panoramautsikt fra en høyde på 140 fot (42 meter). Etter å ha erobret Nohoch Mul-pyramiden, følg din guide til noen av parkens historiske høydepunkter, kanskje leie en sykkel for å utforske området enkelt (egen regning). Etter grundig leting, kom tilbake til treneren og vent til en tradisjonell Maya-landsby for å samhandle med sine urbefolkninger. Få innblikk i den fascinerende flora og fauna i regionen og lær om den kulturelle skikken i Yucatan-regionen. Avslutt turen med en revitaliserende dukkert i et ferskvannsvaskehull før du returnerer til hotellet ditt i Cancun eller Riviera Maya. My girlfriend and I had a great time on this Coba and Mayan village tour! We started pretty early in the morning, but well worth it. Tour guide and air conditioned shuttle van were great for our small group only about 6 of us. 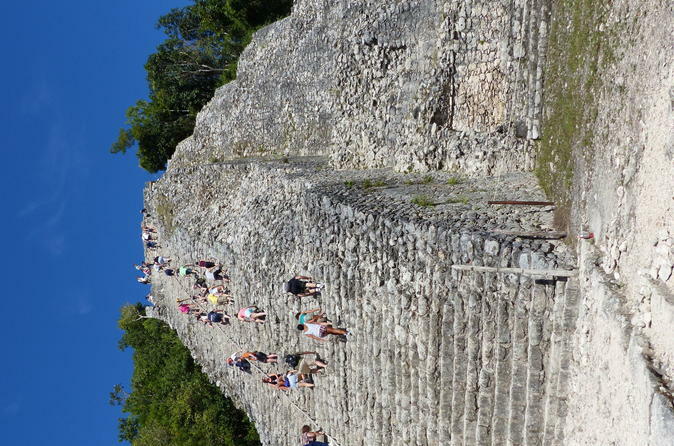 The lunch was excellent, and the stay at Coba allowed more than enough time to tour around and climb the ruins. Looking forward to booking with this group for our next ruin tours. We did a combo cultural and Coba ruins tour for my family of 4. My kids were too young for the "adventure tour." We visited a Mayan village, private denote, a traditional home, and observed shaman's blessing ceremony. Our guides were fantastic and very informative. Learned a ton, delicious lunch! Our tour guides were great. We went to a mayan village and did a religious ceremony, ate homemade tortillas, jumped into a cenote. The lunch they severed was amazing. Then we went to Coba, make sure you bring sneakers for Coba. I also recommend taking the mayan limo to the main temple. It's a far walk. Great trip! This was one of the better tours that we took during our vacation. Pick-up was at our hotel in cancun. Then we traveled in a passenger van to the Mayan Village where some of the tour people split to do the adventure part. Zip-line and repel We toured the Mayan Village and was blessed by their Shaman before jumping into their Centote. Afterwards we went back and met up with the group and had a wonderful traditional Mayan lunch! Loved the Chicken! Food was fresh and well made! Next onto the Coba ruins where we had our Mayan tour guide educate us on the Mayan culture and history! With his encyclopaedic knowledge, Alfredo was in inspiration to anyone wishing to gain an insight into Mayan culture and heritage. This was a true privilege and one which we will always remember. Great tour. Our Guide Alex was informative and nice. Arrived at our resort on time. Ruins were imressive as were the Mayan families we went to visit. Absolutely awesome! Our tour guide, Saul, was very entertaining and knowledgeable. This tour includes some really unique and personal experiences that I don't believe many tour companies are offering. We were taken into rural Mayan peoples' homes, blessed by a Mayan elder, and allowed to swim in a sacred Cenote sinkhole which was a highlight of the trip. I strongly suggest jumping off of the high ledge into the water because it is one of the most refreshing experiences I've had in my life, and the water is so deep there is nothing to worry about. Lunch was delicious and all you can eat! The Coba ruins are, of course, stunningly awesome as well. Climbing to the top of the tallest pyramid was scarier than I expected because the steps are very steep, but it was totally worth it. Take advantage of the opportunity to climb to the top of this pyramid before they discontinue that option! It is the only Mayan pyramid that still allows it, so there is no telling when they will stop. Overall, this tour is a 10 out of 10. You will really enjoy it if you have any interest in the Mayan culture or just different cultures and customs in general.